Peter Cooper has been trying to sell this home-built, remarkably accurate Warthog for over a year now, and it looks like this may be the last chance to save it from the scrapyard. So I really hope someone steps up and becomes the proud owner of this beast, since it's pretty damn incredible. 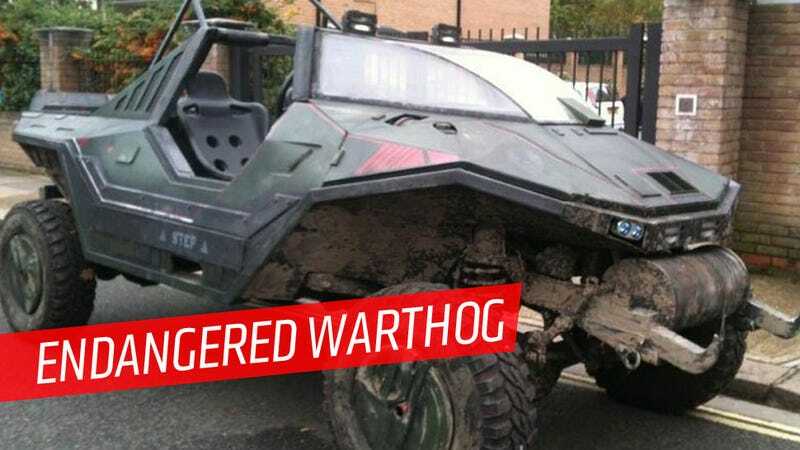 Cooper built the Warthog for an independent Halo fan movie he made back in 2009 called Operation Chastity. It's based on some drawings, fever dreams, and the chassis of a 1982 Land Rover 110. It can be driven, and while it doesn't seem to be totally road legal in the UK, I'm sure someone in some less rule-and-safety obsessed place can get this thing registered no problem. Interestingly, the Land Rover drivetrain fit without too much trouble, and the basic dimensions for the entire project came from scaling up a toy Warthog, which seemed to work remarkably well — Cooper states the differences in size from scaling up the toy to the actual chassis was only 40mm! So, for those of you considering an offbeat off-roader but felt something like a VW Iltis was too, you know, part of reality, and a Unimog is just not, oh, futuristic enough, you really owe it to yourself to hop on this. Last year he was asking about $28,000, which, sure, is a bit steep for 80s-era Landie running gear. But there's an awful lot of custom work done here, and I'm sure the price is much more negotiable now. In fact, on the Tweet's responses right now, he's asking as low as £500, or about a grand or so in real dollars. A STEAL. Lemons racers with access to free transatlantic shipping — what are you waiting for? Seriously, someone should have this other than the crusher, right?